The Pre-Kindergarten program at OVS provides a warm, nurturing environment where children, ages 3-5, learn, grow, and develop confidence and independence. The program offers individualized development of readiness skills in ways that foster a love of learning. Learning is fun with a wide variety of hands-on activities and games. Our youngest students, called Tator Tots, begin at age 3 and typically spend two years in Pre-K before matriculating to Kindergarten. Students at this beginning level can enroll for two, three, or five days a week. After-school care, snacks, and hot lunches are provided. We have an enriching fine arts program that, added to the foundation of the classroom, helps in the development of the whole child. The Pre-Kindergarten program utilizes the natural beauty of the campus as a teaching tool, a way to relate what our students are learning to the outside world. Children begin to learn practical self-help skills in the Pre-Kindergarten program. They become more independent and competent in taking care of themselves. They learn to clean up, put away their own work and learning materials, and to help care for the classroom. These practical skills are valuable not only in themselves, but as builders of a sense of competence, cooperation, and developmentally appropriate impulse control. 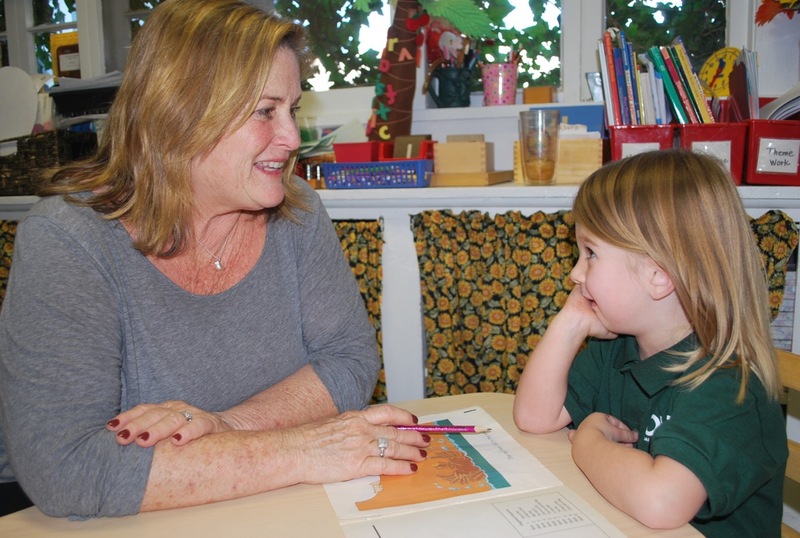 We take the phonetic approach to learning using Montessori tools along with Ojai Valley School’s philosophy on learning. Every child is worked with individually and at his or her own pace through the use of sand paper letters, the moveable alphabet, three letter phonetic word lists, and phonetic readers. Learning is developed through monthly thematic units. The classrooms are transformed into learning environments based on the specific topic in which the students are immersed. Through art, language, math, and science project-based activities, students help to create their own learning environment.